President Obama continues to have sky-high job ratings among liberal Democrats — 90% approve and just 8% disapprove in Pew Research’s poll earlier this month. Their approval of his job performance is twice the rating given by the public as a whole (which rose slightly to 45% after steadily declining over six months). Although 90% approval among liberal Democrats is historically a solid showing for Obama, the 54% share who strongly approve is tied for worst among the 13 times over his presidency that Pew Research has asked about approval strength. This June, the most recent time we had asked about approval strength, 73% of liberal Democrats strongly approved of Obama and 17% approved not so strongly of his job. The lukewarm support for Obama among liberal Democrats largely comes from those ages 18-49. 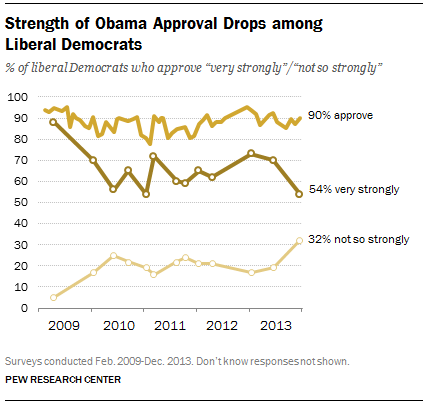 Among both adults under 50 and those 50 and older, 90% of liberal Democrats approve of Obama. But whereas 65% of liberal Democrats 50 and older strongly approve and just 20% say they approve not so strongly, the younger group is narrowly divided (46% strongly approve, 39% less so). 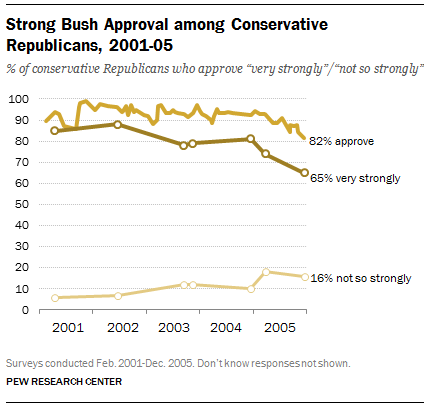 Among each one’s base, neither Obama nor Bush had quite the combination of overall and strong support as their predecessor Bill Clinton at a similar point. In the midst of the Monica Lewinsky scandal in September 1998, Clinton captured the same level of approval as Obama among liberal Democrats (91%) and 70% of Clinton’s base strongly approved of his job.